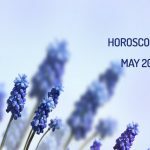 Do you want to know more about your May Horoscope? In May 2018, the entrance of Uranus to the sign Taurus will direct the energies to increase individual perseverance, before facing reality and the need to finalize stated goals. On the other hand, the movement of the Sun and Mercury towards the Gemini sign highlights the importance of interaction with others, in order to refresh ideas and form new criteria. Chiron is in Aries, indicating to the natives of the ram that it is time to work on any insecurities that they hide, among other aspects of the personality. Read the May Horoscope for Aries here. Jupiter remains in retrograde in the VII House of Taurus, where the asteroid Psyche can also be found; this relates to lessons related to trust in couples, and the recognition of why you attract certain types of people. Read the May Horoscope for Taurus here. Eros will enter the XI House of Gemini on May 24th. This asteroid governs creative passion, but also lust and eroticism, so attraction to a colleague, friend or disciple will not be surprising. Read the May Horoscope for Gemini here. The entrance of the Sun into the XII House of Cancer (05/20), marks the victory over hidden enemies, but also the need to experience solitude and work on introspection. Read the May Horoscope for Cancer here. The transit of several planets (Sun, Mercury, Venus and Uranus) in the X and XI Houses of the lion, indicate professional reinvention and the projection of the work profile, between different groups of interest. Read the May Horoscope for Leo here. The finances of Virgo natives will maintain a positive trend during the month of May. The income obtained through the labor source will remain stable, but the additional transactions will generate benefits. Read the May Horoscope for Virgo here. If you decide to go on a diet or change image, do it with the help of qualified professionals. Avoid taking recommendations from the internet, or following any procedure designed for another person. Read the May Horoscope for Libra here. Venus and the asteroid Palas will enter the IX House of Scorpio, on May 19th and 21st, benefiting actions related to teaching, mentoring, learning and contacts abroad. Read the May Horoscope for Scorpio here. Uranus will enter the VI House of Sagittarius on May 15th (the day of the New Moon will be in the same location), so it will be a time to start projects and break old habits. Read the May Horoscope for Sagittarius here. Ceres will remain in the VIII House of Capricorn, indicating that you will have the support of your partner and close relatives, but it is essential that you avoid entering into confrontation with them for economic issues. Read the May Horoscope for Capricorn here. It is time to leave the past behind, and promote new ways of thinking. These moments of solitude and introspection will be the perfect catalyst to organize your ideas, and choose a definitive direction. Read the May Horoscope for Aquarius here. The presence of Ceres in the VI House of Pisces invites you to have a more receptive attitude, with respect to the changes necessary to improve different aspects of your daily life (work, food, exercise). Read the May Horoscope for Pisces here.